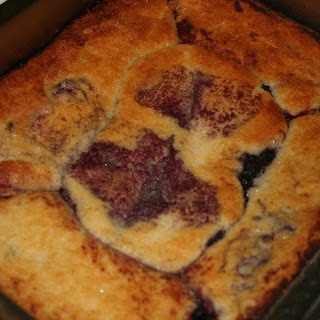 Homemade blackberry cobbler - yum! August is here and we've got blackberries ripening all around. We're not at the height of the season yet but it's getting close! If you've got blackberries and want to make an easy dessert, look no further. I've used this recipe for over 40 years and it's always a hit. Giving credit where credit is due - thanks, Mom! Cream butter and ½ c sugar. Mix flour, baking powder and salt together and add to creamed mixture alternately with milk. Stir until smooth to form a thick batter. Spread batter in greased 8"x8" pan and top with berries. Sprinkle ½ c sugar over the berries and pour juice over top (yes, really - pour it over the top!). Bake 45-50 minutes at 375 degrees F.
I don't even have to ask for a rating on this one - I know from previous experience that it's a favorite and rates just below cherry pie, so we'll say 12/10 served plain and 14/10 if you add a scoop of vanilla ice cream. How's that for creative ratings?